Silent Valley National Park, the core of Nilgiri Biosphere reserves, is a unique tropical rain forest which is closed on all sides by continuous and high and ridges and steep cliffs, lying in Palakkad and Malappuram districts of Kerala state. Kunthi river and its tributaries is the lifeline of Silent Valley National Park which starts from the Nilgiri mountains at a height of around 2000 meters and flows through the Silent Valley Park. 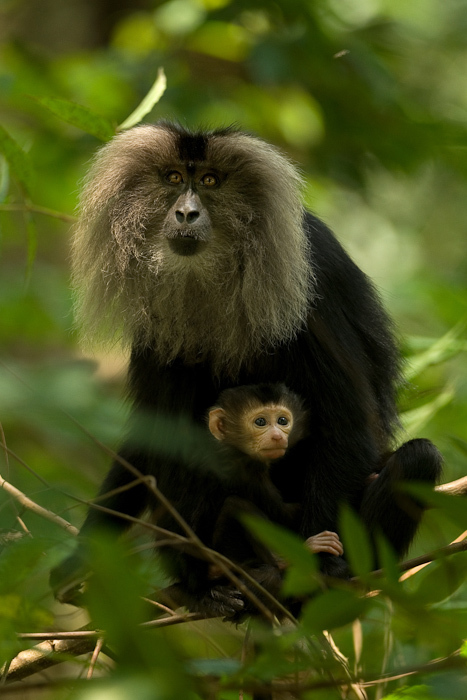 Lion Tailed Macaques with its baby in Silent Valley National Park. Photo taken from Wikipedia / Wikimedia. Silent Valley National Park is very rich in flora and fauna. There are more than 1000 flowering plant species alone in the Silent Valley National Park, most of which are endemic to the Western Ghat’s, a UNESCO World Heritage site. There are 34 species of mammals, 292 bird species, 31 reptile species, 22 amphibians species, 13 species of fishes. Butterflies and moths species number around 500! Silent Valley National Park is famous for the Lion Tailed Macaques. How do I go to Silent Valley National Park? What about accommodation in the Park? Palakkad railway station is the nearest one at around 55 km distance and Coimbatore at 90 km distance. By road, you need to go via Mannarkad and Mukkali, if you are travelling from Palakkad. Or Via Anakkatty, if you are coming from Coimbatore. Kerala forest and Wildlife department has a Inspection Bungalow with 4 two bed-rooms, one large room with 7 beds for group travelers and a hut which need to be booked in advance. This entry was posted in Travel and tagged Lion Tailed Macaque, UNESCO World Heritage site by greatkerala. Bookmark the permalink.